I happen to agree. This thing may be less bad than other RVs, but it's still a monster that's using lots more than zero resources. Absolutely no need to be apologetic for living and doing your thing, but also be realistic about it's cost. It's probably worth it to have the space and convenience, but honestly that thing seems like a behemoth. It's all in the eye of the beholder, we are childless and so even the idea of a full size pickup seems ridiculously wasteful to us. Owning & driving a particular vehicle doesn't make you green or eco-conscious. Attitude, state of mind and behavior make you eco-friendly. Just the fact that Shapiro has this in mind while building his truck makes him miles ahead of most 4wd owners (and most Hybrid owners), who talk the talk but don't walk the walk. this is going to be sweet, cant wait to see final product. What suspension does the chassis have? Leaf springs (stiff?) or some type of air suspension? Are you thinking of changing or modifying what it has? The suspension was actually one of our first challenges. I had posted a thread about it here back in July. My original intention had been to go with leaf springs all around. Stiff, but simple and reliable. There's not much that can wrong with a leaf spring, and if they do, there's mechanics around the world who can fix a stack for you. However, the candidate trucks that we found had air suspension in the rear, and leafs up front. I asked around (including on ExPo) and decided that it was still ok, and we went ahead with it. The choice then was to swap out the front leafs with airbags? We decided not to, as the same 'ride' benefits could be accomplished by putting airbags under the cab, and if necessary under the seats. This keeps the easily damaged bags up and out of harms way. Also, if they fail, it's not such a big deal as you're still riding on the base leaf suspension. The only other choice was whether or not to convert the rear back to a leaf. I think for the moment, we'll carry on with the air suspension - which rides nicer anyhow - can be aired down if we want to - and is fairly cheap to just carry one spare bag in case of a tear. Who is being delusional here? Waste treatment is accomplished in the US by expending vast amounts of energy, much of which is derived from fossil fuels. What is the difference exactly? Burning waste is much prefered to simply dumping it, IF chemical treatment or waste treatment is unavailable. In most places "overseas", there will be no practical waste treatment options. It's not like they will be doing a world tour of all the worlds major metropolitain areas. Rural areas often lack even basic sanitation. "Despite continued efforts to promote sanitation 40% of the world's population is still without basic sanitation. This number does not tell the whole story, sanitation coverage is often much lower in rural areas than in urban areas. For example, in Africa 84% of urban but only 45% of rural residents have access to basic sanitation. The numbers are similar in Asia where 78% of urban and 31% of rural residents have access to basic sanitation (WHO, 2000)." I guess what I'm saying is that burning some poop in the middle of nowhere sounds ecologically sound to me. Mine are the size of a pop can, those look like kegs. In addition to a spare bag, you may consider bringing two spare airlines as well. I fail to understand your logic. Am I missing something here? Did anyone claim this was a zero resource build? How is that even possible? How does this vehicle seem like a "behemoth"? They are traveling around the world with two children. This vehicle is a conveyance, home, and classroom, all rolled into one. Seems like a small footprint to me for such duties, but maybe I am failing to consider some issues? We were childless once....a tent and the Jeep were just great. But with 2 children now Jay's rig is just starting to seem adequate. What an incredible way to recreate with your children. If I were happy with calling the KOA adventure I'd be in a nice shiny Prevost. But we, members of this forum are outdoorsman, and man made attractions don't hold a candle to mother nature. It is all in the eye of the beholder and it will most likely have a much smaller carbon footprint than a Prevost! Are you keeping the dual wheels? When you flatten the floor, are you making extra storage space as well? This is going to be awesome build, good luck with it. The truck is going to be cool, but, I am interested in your travel plans, where are planning on taking the beast, are you pulling the kids out of school, then "home" schooling them? Bumper looks great, it's going to be exciting to follow your build. It's possible that I am missing it. Entirely possible. I'm out of step with a lot of things anymore. Anyway, if he is selling his house and does not have a regular job then he is truly reducing his footprint. Oh, and the kids are still tiny, but yes the plan is to homeschool them as we travel. What are your plans for attaching the shelter to truck frame? Any thoughts on a torsion-free mount? We're definitely mounting the camper box on a 3-point dynamic mount. Don't want it twisting itself all out of shape. At the same time we're reinforcing ("Sleeving") the F-650's frame rails to try and reinforce them to reduce some of the flex there anyhow. We're definitely mounting the camper box on a 3-point dynamic mount. I really hope you come up with something really slick, because I also want a cab-over, and want you to do the design work. A less-comon torsion-free mount is the four-point. One front center, one rear center, and one on each side, in a diamond patern. 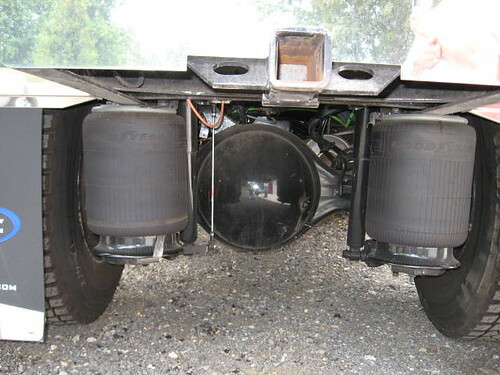 I wonder if you could mount the cab AND camper on a subframe, then use the four-point to attach the subframe to the chassis. That way you could rigidly attach the camper to the cab, and have the whole thing isolated from the chassis. Pretty serious design and fab involved, though.